It’s organic beauty week this week, so I thought I’d share some of my favourite beauty brands that fall into the organic range. I always try and opt for more natural products (though some less so always creep in) as I do notice more of a difference to my skin when I use them. These brands are among my favourites to use and I haven’t reacted to any, which is an issue I often have with skincare. I’ve only tried three products from Nourish, but I’ve liked every one I’ve used. Recently I’ve been sampling their new Nourish Kale Enzymatic Exfoliating Cleanser, which is a quite thick, paste-like cleanser which you can move easily around your face. It has gently exfoliating particles in it (nothing scratchy!) and it leaves skin brighter and smoother, 81% organic too. You all know how much I love facial oils and the wonderful Pai Rosehip BioRegenerate Oil makes a quite frequent appearance in my skincare routine. This organic wonder works with your skin to help reduce blemishes, even skintone and generally hydrate your complexion. Facial oils are 100% worth the purchase, as they’ve made such a huge difference to my skin. I would love to try more from the Pai range in the future! I’ve tried a whole host of Antipodes products in the past and they’re honestly one of my favourite natural skincare brands. The most recent addition to my collection is the Antipodes Avocado Pear Nourishing Night Cream (the tub in the middle), which is a thick moisturiser that leaves skin oh so soft. I also adore their Antipodes Apostle Serum and they have an entire section of their skincare that’s certified organic. This brand is well known for their Trilogy Rosehip Oil (which I have and love) but I really adore their Trilogy Hydrating Mist Toner, which is reasonably priced and smells divine. They offer a lot of natural products and it’s a brand I’d been keen to pick up some more pieces from. I love this brand as they’re really reasonably priced, but offer a whole host of products with a lot being 90%+ natural and mostly organic. I’ve been trying out their new Organic Surge Daily Care Face Wash which is great on sensitive skin and has a light rose scent. 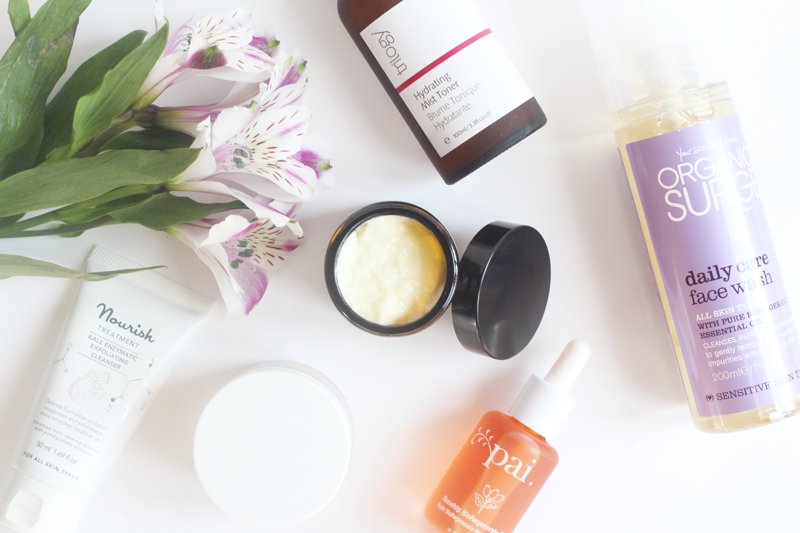 They’re worth checking out if you want to look at more natural skincare but are on a budget! Balance Me are definitely in my top five favourite skincare brands of all time. I’ve never had an issue with any of the skincare I’ve tried and they always improve my complexion, so I know I can count on them. My favourite is the Balance Me Radiance Facial Oil and, although I haven’t featured a product by them here, I couldn’t miss them off the list! They’re a reasonably new brand for me, but one I have fallen a teeny bit in love with since trying my first product. They’ve released a new serum this month (which I’m dying to try) and I love the One Love Organics Morning Glory Brightening Complexion Booster, but a product I’ve been sampling recently is their One Love Organics Skin Saviour Waterless Beauty Balm (note the lid haha, will feature it again in another beauty post no doubt!). It’s a great multi-purpose balm which you can use for cleansing, moisturiser, taming flyaway hair or even mixing into powder foundation to create a base. A little does go a very long way! Do you have any nautural or organic skincare brands that you love? Let me know!